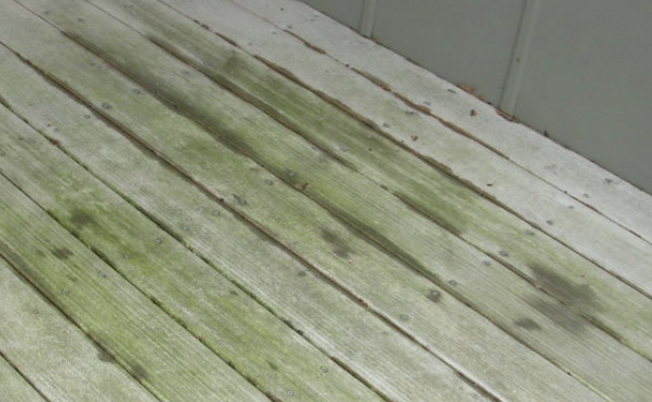 Deck stains adhere and penetrate wood better that is more acidic. So when the wood is left with a high pH balance the stain will not penetrate or perform as well as it should. This jeopardizes the longevity of the stain causing more frequent maintenance and costing you more money. The increased pH level also darkens the wood which can affect the overall appearance of the deck even after it is stained. The way this phenomenon is reversed is to simply apply a neutralizing acid to the wood after cleaning it. This mild acid formula known as deck brightener or deck neutralizer cancels the condition of the caustic soaps and restores the wood’s pH balance to a more neutral or acidic state. This also “brightens” the wood and enhances the wood grain. Once the wood brightener has done its job it can be rinsed off and your prep work is complete. 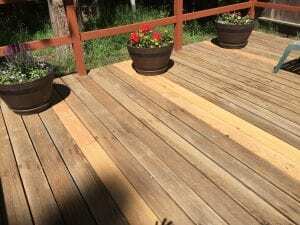 This two-step cleaning and deck brightening process is the same one used by professional deck cleaners and can give you similar results. It enhances the beauty of your wood deck and ensures you get maximum protection and lasting results from your deck stain. I stained my deck last year with a solid water based stain. Will wood brightener make the stain brighter or what can I use to make it look fresh again. I don’t think it needs to stained again. Any suggestions will be greatly appreciated. No. A brightener has no effect on a deck stain. Thanks for the quick response. Do you know what I can use to replenish the color? No, that is not really possible. You can clean and see if that helps. Will wood brighter hurt Vinyl siding? I plan on using it on my fence as well as my deck. No, it should not have issues with vinyl siding. We have two different problems on our redwood decking. 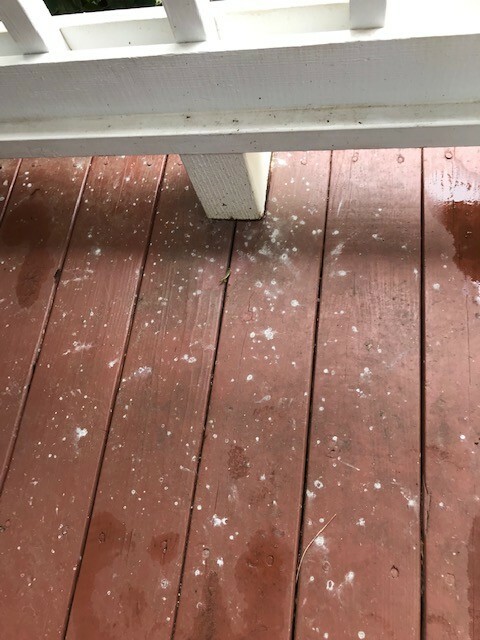 I used a Cabot stain on our covered front porch and after about half a year, it began having white spots – I sent pictures to Cabot but they didn’t know what they were or how to treat them other than using a Cabot brand cleaner. 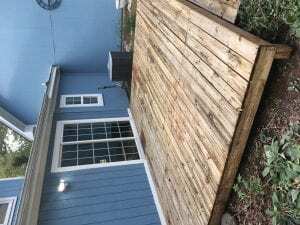 We had a massive new deck put in last spring and I used Cabot again – was so disappointed with the appearance of all of the boards that took on a black look over the winter – again, sending pictures to Cabot didn’t resolve anything – I was hoping for advice on what to do. I rolled the stain on both decks. I’m 77 – willing to try anything. The white spots are not from the stain but something else sitting on top. Maybe mineral deposits from rainwater drying on the surface. The black is mildew, dirt and leaf stains. You can clean that off. 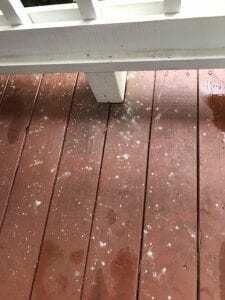 A deck stain cannot prevent these things from accumulating on top of the coating. I really appreciate the information! I bought a container of Simple Green deck cleaner and a long handled brush – hope to see some positive results. Is Olympic Premium Deck Brightener and Wash carcinogenic. No, I doubt that it is. I’ve been using Restore A Deck stripper on a series of porches and decks, which has been somewhat successful. But some sections haven’t come off and I’ve been sanding them. Underneath the wood is pretty dark and grey. The Restore A Deck stripper says to apply brightener immediately while still wet, but then I need to do it again after sanding off anything that didn’t come off with the stripper. I’m wondering if it’s a problem to let the stripper dry and just do the brightener once before I’m ready to apply stain? You can brighten all at once when you are done. 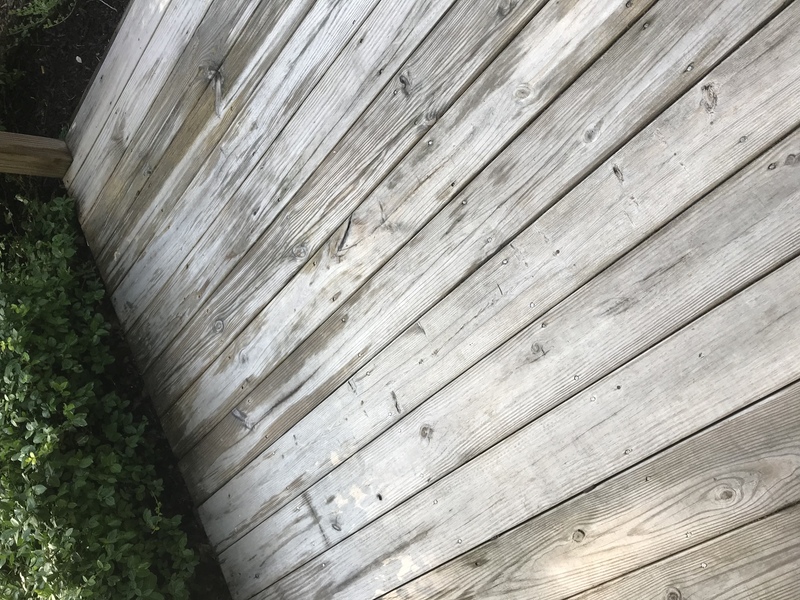 1 – if I follow your recommendations of cleaning, brightening a sanding do you feel I can bring the overall look of this deck back to a respectable looking state? 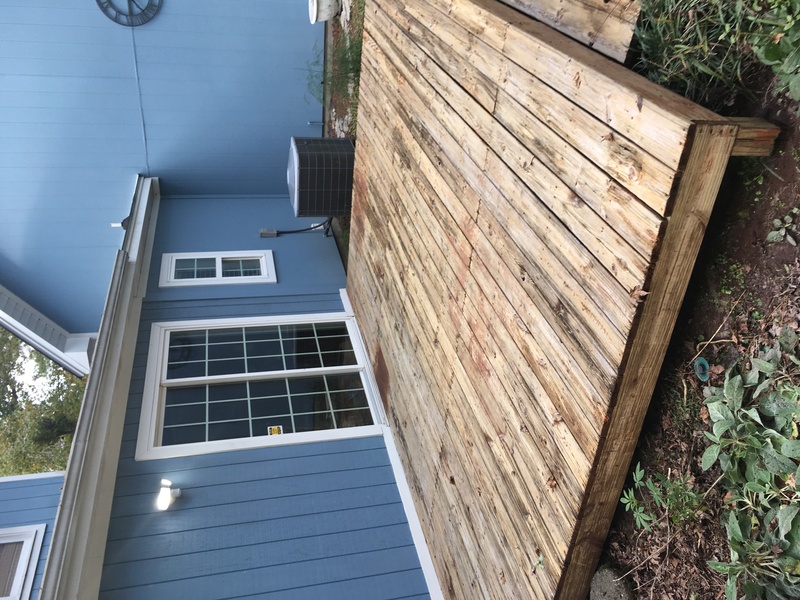 2 – should I then stain this deck with a semi-transparent stain or with the deck being this old should I use a solid color stain? 1. Yes, No need to sand though. Just clean and brighten. Thanks for the website! I built a cedar shadow box style fence last year and it has only slightly grayed but I want to clean it to get it back to its original color (or close to) and then stain it. 1) Would you recommend using a cleaner although there is no current stain on it and it has been less than 1 year since I built it. 2) Would a brightener still be useful without a cleaner? 3) What stain/sealant would you recommend to bring out the natural colors? 1. Yes, you have to clean and brighten for the prep. We have a 3-month old deck of kiln dried redwood. At the advice of the GC who built it, we stained the floor a month after installation with Armstrong Clark to protect it during the rainy season. Since then there has been a ton of tannin bleed on the stained boards and the stained surfaces now look very dark and dingy. We tried a Restore a Deck cleaner and brightener on a couple of the stained steps and the tannin bleed cleaned up great after brightening. Now we would like to clean and brighten everything. Does applying cleaner and brightener within a few months of our last coat of stain destroy the protective qualities of the stain? i.e., do we have to restain every time we clean+brighten, or will doing so cause excessive stain buildup? Yes, you will need to apply a light coat of stain after doing the RAD Cleaner and Brightener. I have sanded back my old merbau timber decking but haven’t had a chance to re oil/stain . If I wait say 6 months will that have an effect of the final outcome in regards to bringing out the natural colour of the merbau timber . You will need to prep again. Use a deck cleaner and then a wood brightener for the prep a few days before staining. Just pressure washed my deck and I have some red stain left. I would like to keep the grain so I don’t want to go solid. Suggestions? Also after pressure wash how long should I wait for stain. Temps are in the 50s to 60s. Try a stain stripper and pressure wash again. Brighten the wood after. I discovered your site halfway through my deck restoration. The deck in question is a south-facing, 2nd story parquet-style deck that is a very weathered 27 yrs old. Previous owners covered it with Deckover which didn’t adhere well and I had to scrape & sand it off as it was ugly and trapping water. 80% of the actual decking I’ve replaced with new PT pine boards over which my partner has installed plastic deck tiles. In the spring I plan to stain the decking and reinstall the tiles after thats done. The current dilemma is that I’ve just finished sanding the railing caps, rails, spindles and posts down to clean wood. I began staining (Armstrong-Clark Semi-Transparent Driftwood) them but then the weather just turned to low 50’s and rainy…it looks like 1-2 weeks before 60’s and some sun. 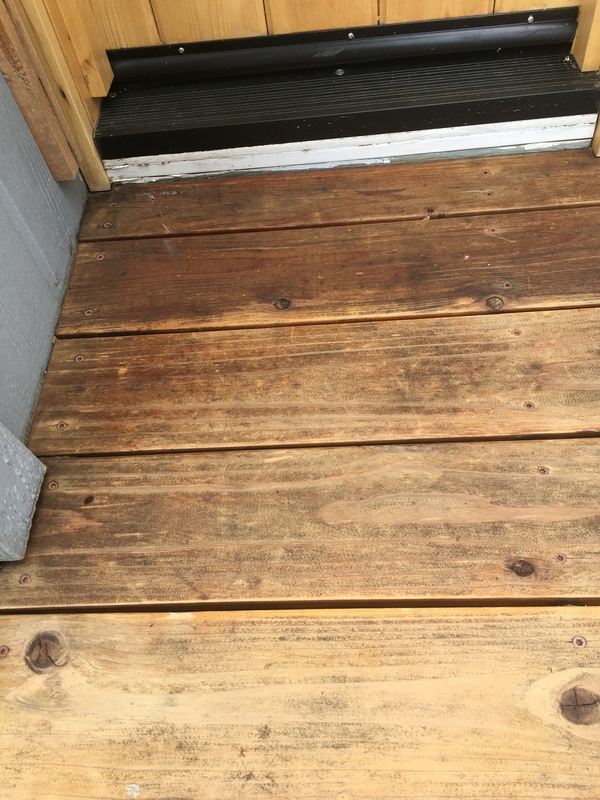 The first section seemed to stain well without brightening but after reading about proper prep, I went out and bought some Olympic Deck Brightener and Wash that was on sale. While I wait for better conditions, would it be a good idea to prep in wet low-50’s? And is this product good enough? You should be fine with temps but that is not a very good brightener. I appreciate the reply. Just to be sure, the wood had gotten wet from the rain after sanding and then the temps dived from 80 to 50’s and will remain there for at least a few days. I need to go get a tarp over the rails (top caps & spindles were removed to garage so they’re not an issue) to prevent further saturation. But in the 50’s how long do you guess it may take to get to below 20% moisture for staining? And does that wood that got wet most likely need a light 80 grit re-sanding? A few days and it should be okay to stain. You do not need to resand if the wood gets wood. I clean my deck with deck cleaner and power washer, and there is still green and black stains in deck. will the brightener take away the stains? do i have to get the stains out before sealing it? My concern is if i dont get the stain out the sealant wont hold properly. That is algae. Try watered down bleach. 1 part bleach to 3 parts water. Apply to entire deck. Let sit for 20 minutes and rinse well. Hopefully, that helps. BTW, it is most likely wood rotting from underneath. I used the RAD cleaner and it was doing a great job, but when I ordered more, I accidentally ordered stripper instead of cleaner. The deck had never been stained. Would it be okay to use the stripper and then the brightener in place of the cleaner? It may “fur” up the deck too much if you use the stripper since it does not have an old stain to remove. You can try, but water down the stripper to about 2-3 oz per gallon of water. This is not liquid stripper it is the RAD powdered stripper so maybe I should just use 1/4 to 1/2 of the amount of the powdered stuff it calls for. What do you think? Yes, I know that. 2-3 oz of powder per gallon of water. Normal is 8oz. Thanks – one last question – can you add a tint to these stains to achieve a different color result? No, you cannot add tint to them but you should be able to intermix colors of the same brand to achieve a different color result. Having a deck built in the next few weeks in the St Louis area. Using pressure treated pine with a light cedar tone already on. Plan on using a semi- transparent water base . When should I do this. If I do it right after construction just hose off all dirt and debris and then stain? I’ve heard to wait a winter season before using any product. Thank you. I am trying to revive a 3-year old cedar deck that is in lots of shade and had serious mildew. The initial strippers had little effect so I have sanded the entire deck down. Used a cleaner to finish the job, but the deck is now quite light. I understand the value of a “brightener” to correct the pH. But I am worried that the brightener will unnaturally lighten the wood. Which is the “before” and “after” in the photo at the top of the page? Is there another way to get the pH correct? No way to restore pH without using a brightener. The brightener in the pic is on the left. Will deck cleaner and brightened damage aluminum balusters? Depends on if the spindles are coated or not. Try a test spot first to be certain. I have a one year old covered pine deck. It is currently bare wood. I want to prep and stain but am worried about it drying out fully after washing and before staining given that temperatures are starting to drop. (I’m in southern Ontario.) How long does it have to dry before staining? How warm should it be outside? And if drying is a concern, might I be able to achieve similar results by only sanding? (There is no old stain to remove, though there is some dirt / graying.) I also don’t want to wait until spring as I am concerned that leaving it untreated for another winter will reduce its longevity. Thanks in advance. 48 hours after prep. Temps above 50 degrees f. Sanding is not a good way to prep. I have used a cleaner/brightener on my cedar fence. It looks amazing. Now my dilemma is with the weather. I did most of the cleaning/brightening on Monday, finishing it Tuesday evening. I read that it is critical to let it dry 48 to 72 hours before applying a semi-transparent oil based stain. The problem is the forecast. Starting Thursday at noon (not quite 48 hours) we are getting thunderstorms for a week. Can I wait until next weekend (10 days) to Stain or will I lose the effect of the brightener and have to start over? Yes you can wait up to 2 weeks to stain after prep. OMG you are a life saver! I couldn’t find that information anywhere! Thank you! Just finished cleaning a 3 year old deck that was never treated or sealed. I used a “recipe” of water,powdered laundry detergent and bleach…sprayed on, scrubbed in and rinsed off. I still have “graying” on the surface. Would a cleaner and brightener bring me back to new OR would I have to opt for a stripper instead…? A good deck cleaner and light pressure washing should remove more of the gray. Brighten after as well. Much appreciated and thanks for the quick reply. This “kit” is on Amazon…Can I assume it is NOT the same as the RAD kit you speak of here on this site ? Not the same brand but I believe the other RAD Kit is on there as well. 1) Is it better to wet the wood first before applying brightener (Woodrich Citralic) – or just spray brightener on the dry stripped wood? 2) The Citralic brightener instructions say to “agitate” and work it into the wood using some scrubbing/brush. Is this OK to do – or will the scrubbing create spotty results etc? 3) The stripper did a great job on horizontal floor boards. But, all vertical spindles which were in great shape with old stain intact did not strip much and look a little uneven (most old stain is still on) . I do not want to use more pressure and damage the wood, and would rather avoid the hassle of stripping the vertical boards. So, if old stain is holding well, is it possible to just recoat those as-is? I am using a different brand stain this time – but color is a close match and both are oil based semi transparent. 2. You can agitate but no need in our opinion. 3. No, it has to come off if switching brands of semi-transparent stain. 1) I still have not started brightening. But, now that the wood is dry after stripping, I can see that two-third of the deck looks like fresh/raw yellow PT pine even without brightener. However the remaining third of deck has turned DARK due to the stripper. I plan to apply brightener all over, but cannot figure out why this dark section did not turn out yellow like the rest… is this normal? I am concerned that this dark section will not match the rest, so wondering if I need to re-strip dark areas before brightening it all? 2) A lot of “fuzzies” have started to surface after stripping. If I do not sand and let the elements wear the fuzzies off, will the stain look really “rough”.. and how long does it usually take for fuzzies to disappear naturally? 3) Which roller cover (brand/material/nap/length etc) do you recommend for semi trans oil stains? I plan to roll and back brush. 4) Any tips for staining the 4 sides of vertical spindles quick without a sprayer? Is it possible to use a cloth/mitten to wrap around and stain all sides at once. Any other ideas? 1. Not sure why it happened but hopefully it evens out when you brighten all of it. 2. They typically darken in color and do not show when stained. 3. Do not use a roller. Use an exterior stain pad. 4. No. Use a brush or exterior stain pad. If it isn’t good enough after the first application and rinse can I use the brightener a second time? Yes but it should be good the first time. I have some Olympic Cedar and Redwood Deck Brightener left over from 2011. It worked well on my redwood deck then. Can i still use it? I have no idea if it will still be good or not. We would buy new to be safe. Would you re-order any of the steps listed above? Skip the wood filler. Never works on exterior wood. Cracks and looks unsightly after a period of time and there is no need for it anyhow. My new deck had aged about 8 months. The deck was professionally cleaned using Sherwin Williams president, then semi-transparent stain was applied in September, 2018. Unfortunately, the wrong color. The pros then stripped th deck then used S-W Revive. Then stained again using the correct color. 10 months later, the deck looks terrible. Splotchey in spots, dark stains from leaves, just looks really bad. S-W has suggested that the deck again be stripped and Revived, then a Solid color stain to be applied. 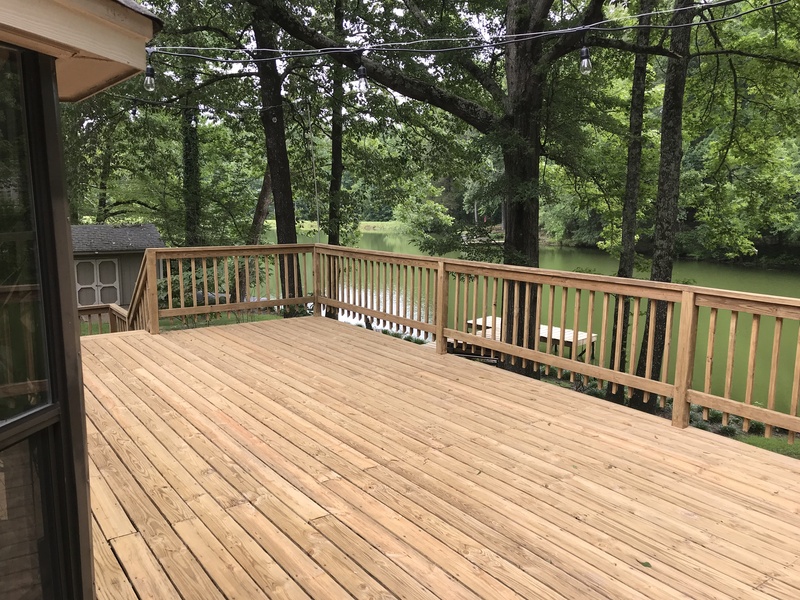 Any other suggestions to get a good looking deck that will look good for at least a few years? As long as you strip the deck and brighten, you can use any brand. A solid stain will tend to peel though. Try a semi-solid color by Armstrong Clark. Stay away from SW products. That is old stain that needs to come off. Use a stripper and then brighten all the wood. Thank you very much – will try! I have a large 5 years old pressure treated deck with about 8-foot clearance below with nothing under the deck, at this point. I’ve stained the support posts but not done anything directly under the deck. I have some mildew and staining under the deck. I recently stipped and sanded the top level and getting ready to re-stain. What should I do to care for the underside of the deck? No need to do anything unless you want to for appearance. Thanks for the helpful article. I just stripped my sun drenched 3 year old pressure treated deck of a semi-transparent stain that failed after only a couple months. I’m about to restain with a Cabot oil penetrating stain. After using an eco-friendly stripper and no power washer, I’m a little loathe to use more chemicals such as the brightner. Rain is forecast the next few days; is it enough just to let the wood be rained on, let dry completely, then stain? Or is the brightner imperative? I don’t need to brighten the wood, it’s in good shape. I’m just wondering if the rain is enough to clear and neutralize the stripper. Thanks! You have to brighten to neutralize the stripper. Leaving the wood in a high pH balance it not a good idea. Weathers a little wet today with rain. 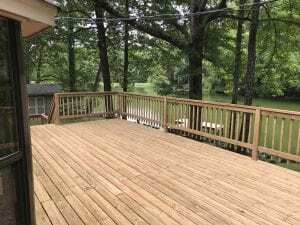 Is it ok to use the Defy Wood Brightener on a deck wet from rain? If I sanded a deck stain away, do I still need brightener? Clean and sand to open the pores for the final prep. Appreciate the quick response. Thanks! I recently used stain stripper but did not realize I had to treat it immediately with wood deck brightener. It has been already a few days since we used the stripper. Could I still use the wood deck brightener? 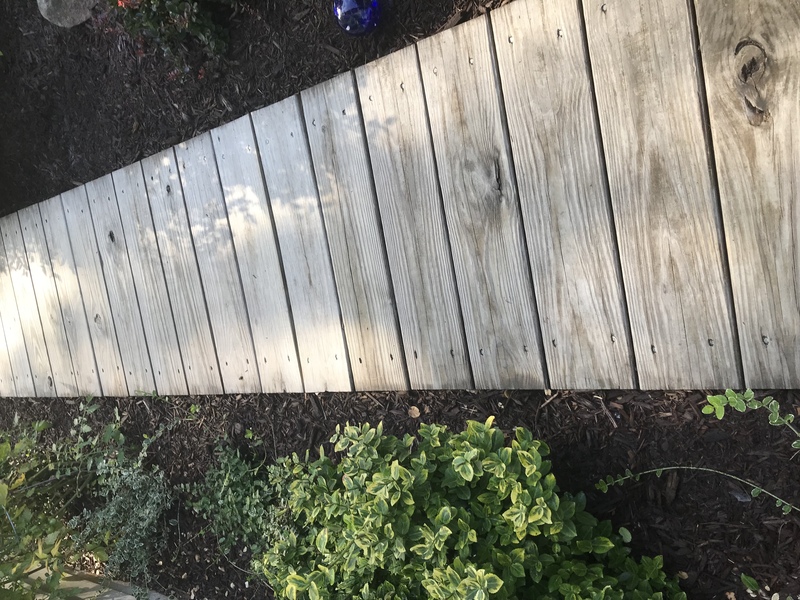 I power washed a one year old not stained pressure treated deck. The light graying has all but gone Can Inuse a deck brightened just to make sure the wood is as close to new in the brightness category or would it be waste of time and money. You were correct. The brightener really brought the wood back to new brightness. Thanks for the help!! If I’m sanding… I start with cleaning and a power washer. Do I brighten at the end when I’m done sanding… Or right after cleaning? Best to clean and brighten after all the sanding is done. 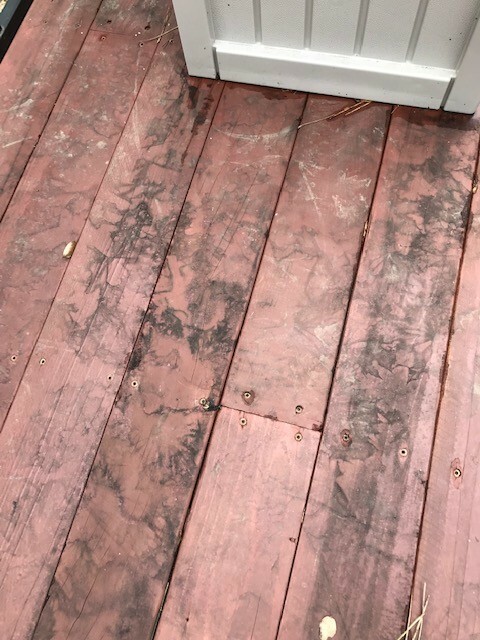 Is it important to use brightener even when using a solid stain on an old deck ? It does help neutralize a stain stripper if used otherwise no need. I am about to start a Deck job and I have the Cabot Deck Brightener and the stain I want ready. My question is, is the Deck brightener the cleaner or do I have to power wash or buy a separate cleaner before I use the brightener. Also how long after I apply the brightener do I have to wait to apply the stain. Also if it is going to rain should I wait? You need both a cleaner and a wood brightener. Do this while pressure washing. Typically stain 2 days later but that varies on the stain brand. So you are saying that I will need to power wash the porch while I am applying the cleaner? How long should I wait to brighten once cleaned? Also could you recommend a good cleaner? 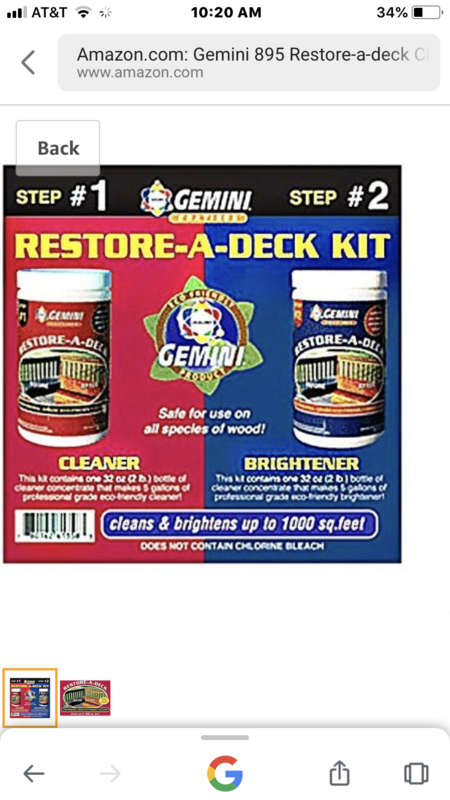 Use the Restore A Deck Cleaner and Brightener Kits. You apply the cleaner and then pressure wash off. As soon as you are done, apply the Wood Brightener. I need to strip my deck first, then follow up with a wood Brightener. Both defy products. After I use the Brightener, how long do I have to apply the stain before the wood Brightener would need to be applied again? I want to avoid all things bad for stain like high humidity, high temps, rain and direct sunlight. I had my deck power-washed (they are very careful about using the proper pressure so as not to damage the wood.) It looks pretty clean, no mold, not sticky… but I am wondering if I should still use a wood brightener to prep for re-staining. It would not hurt and could help the stain to soak in better. I stripped my deck (after way too long) using Wolman Deckstrip. It looked almost brand new and the wood looked light and bright. I then used the Wolman Fence & Deck Brightener and power washed it off. It now looks darker with streaky orangish and blackish streaks. Did I do something wrong? Should I put more stripper back on? No. The Wolmans Deck brightener is not a “true” wood brightener. For some reason, they have it backward as their brightener is a caustic that raises the pH balance and actually is more of a cleaner. Use a true wood brightener that contains mild oxalic or citric acids. This will restore/lower the pH balance. 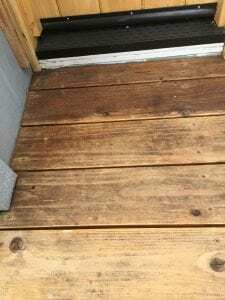 Try Restore A Deck Wood Brightener. I’m ready to apply the wood brightener to my deck, but it’s supposed to rain later today, and off and on all week. I probably won’t be able to do the staining until next weekend when it’s supposed to be dry for several days. So, should I go ahead and apply the brightener this weekend (before it rains), and then wait until all the rain is gone and the deck has dried to stain? Or should I hold off on the brightener until 24 hours before I plan to stain? Just not sure of the timing. The temperature and humidity are really nice right now, but it’s gonna be much hotter this week and higher humidity. Any advice? Brighten now. Stain within 2 weeks. I have a really old deck with old wood, but it is in good condition (bad boards were replaced with new boards). My handyman sanded it down and pressure washed it but it is still gray. When I tried applying a bit of stain as a test, it was VERY VERY dark (supposed to be a light natural cedar color). 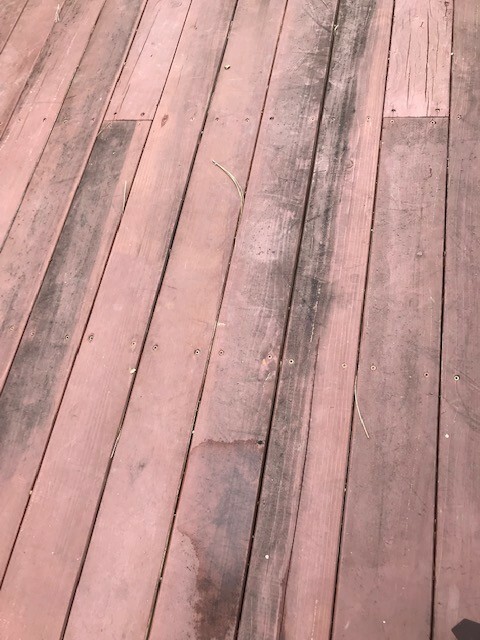 I was told that the wood cleaner and wood brightener would make my deck ready to take stain and have the stain be the color it is supposed to be. QUESTION: Does this 2 step process really work on wood that is more than 20 years old? I hate to go to all this trouble, only to find out later the wood has to be newer. Thank you. The prep would help some to lighten but it will never be as light as the new boards. Thank you. I am starting to lean toward a solid stain. Is there a product you would recommend that would last longer and not peel or flake? This deck has snow on it all winter and a good amount of sun in summer. Thx. Solid stains will tend to peel and do not last any longer. I thought I read something on your site that said you can choose a more ‘penetrating’ solid stain so it is less prone to peeling? If I read that correctly, are there some brands you can recommend? Flood Pro Series Solid Stains is what we use if not using a semi-transparent. In general, we are not fans of solids and only using them if we have to. I live at 6200 feet elevation in an area that gets a lot of snow in winter and pretty intense sun in summer. Do you still recommend Flood for solid stain? I read on your site Armstrong Clark semi solid is good? Is one or the other better for my conditions? Thanks. Like we said, we are not fans of solid stains. If that is what you want, then use the Flood. The AC semi-solid is a better product in our opinion. Thank you. I got a sample of the AC semi-solid and liked it. I am wondering though how to deal with the new boards? Their website says the wood has to be at least a year old. I actually called their 800 number and talked to the owner, Jake Clark, and he said I should stain the old wood but leave the new boards to weather for a year. So, it will look really odd this year to have stain on 90% of the deck but not on 10% of the deck. Do you agree that AC won’t penetrate new boards? I would follow his advice. Sorry if this is a repeat. I live at 6200 feet and my deck has snow piled on it all winter and has intense sun all summer. Is Flood still what you would recommend in my climate? Pressure treated deck 400 sf 12 yrs old . Appears to have a semi transparent stain but with maybe 40% worn to bare wood. Going to strip with the Defy product. Must I continue with the Defy products on the following steps? Or will other recommended products from your list work? Any of them should work. Does old wood treated with brightener eventually turn dark again? Port Orford 18′ trim boards on my new deck turned notably darker in less than 2 weeks after install then all the other deck boards & have taken on a distinct sheen. I suspect they were old to begin with & disguised with a brightener to look new. Research on Port Orford compels me to also suspect that availability of new lumber for 18′ boards may be hard to find so I’ve been sold old wood as a consolation. Company denies using any treatment or chemicals. Not it does not darken after a few weeks after using a brightener. I doubt they did this and wood does oxidize in the sun. That is more likely the reason. It’s very odd that more than 2 months later all the other deck boards are still light golden in color. Only the trim boards darkened significantly & have taken on a sheen not present in the other boards. How could there be such a huge discrepancy under same conditions for same material? Plus, the first trim board installed was already so extremely dark I asked that it be replaced. They admitted it was an older board & said it just needed a brightener. I insisted it be replaced with a new board bc I’m paying a very premium price for a brand new deck. This incident further supports my suspicions that the trim boards are probably old. I won the argument with my contractors to brighten the deck, well sort of, they agreed to postpone staining while I purchased the brightner and did it myself. I used duck deck made of oxalic acid on one side of the deck and Olympic max brighter on the other. I can’t tell if the wood just has natural variations in it due to age and sun or if the pure oxalic acid just performed better. I attached a picture to ask if the Difference was significant enough to go over the entire deck or are we good to start staining? Also, RS recommended the oxalic powder to begin with and told me not to wash it off. I chickened out on leaving it on but I only rinsed it lightly, thoughts? We are in cottage country and I need to clean and brighten the stairs going down to the lake. When I rinse off the product it will run into the lake. What products should I be using that is lake-friendly? The Restore A Deck Prep kits are Eco-Safe for this. Thank you for you speeeeeedy reply! I’ll see where I can get this. Can you post a picture of the product? Do you know who sells this product? I can’t seem to find it (I’m in Canada). I stripped then brightened my 5 year old pressure treated pine deck, the next day after it dried I noticed there were still some areas with stain still on the boards. I sanded all the areas that were missed. The deck looks great now just like new. Can I just apply brightener again or do I need to clean and then brighten again? Did you spot sand or sand all? The stain may not take evenly if you spot sanded if you sanded too smooth in those areas. I sanded all the deck boards at least lightly but heavier were the stain remained, and spot sanded some of the railing spindles. Can I get away with just using brightener on it again? Hard to say if it will stain “spotty” or not. Probably going to be okay. I sanded all the deck boards at least lightly, and heavier where the stain remained. I build a fir deck last summer and of course it gray now and has some rough spots. Would I need to sand, and if so, what prep to do after? No need to sand. Use a deck cleaner and then a wood brightener for the prep. I am almost complete with sanding my deck. Do I need to use both RAD cleaner and brightener or can I just use the brightener? Then stain with TWP. It would be best to use both. just finished using a wood stripper on my red wood deck.know i need to use a brightener. MY ? do i use the brightener prior to sanding? this need doing. as my deck is a older deck.and how long do i wait between applications? am going to use a soy stain so very important i do things right. If you are sanding, use the wood brightener after the sanding is completed. I have a 2 year old fence which I a plan on staining with clear oil penetrating sealer this week. I prepped with deck cleaning product and power wash for half and then bleach and power wash for second half. Now dried, first half looks grey / weathered, second half looks bright in color. Will this color difference remain after i apply the clear sealer? Yes it will. Prep again with both a cleaner and then a wood brightener. Clean and brighten for the prep. If you do not stain, it will gray again within months. Any suggestions on products that are plant friendly? 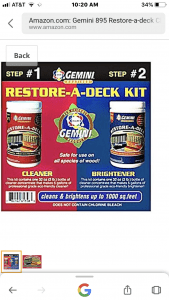 Restore A Deck Prep Products. We use oxyclean on our cedar deck and it works great!